I will let you know what Colgate have to say on this one! OMG Fiona I have never seen that happen before. We get ants on occasion too but never on Brand New Toothbrushes. Cant wait to hear what happens with this. That is creepy! You should buy one of each brand and do an experiment…maybe with a live streaming webcam! .-= Leigh´s last blog ..Happy Birthday Katelyn =-. .-= Eva´s last blog ..Now run along, and don’t get into mischief =-. .-= Simon Food Favourites´s last blog ..Baroque Bistro Patisserie: Free Macarons, The Rocks, Sydney (25 Mar 2010) =-. .-= Amy @ cookbookmaniac.com´s last blog ..Hot Cross Buns by Nigella Lawson – Happy Easter! =-. oh my – that is SCARY!!!!!! In fact I’ve seen ants like this at home on our toothbrushes too! First I thought it was the paste attracting them, but then I realized it was muggy outside for weeks, they climbed up, however the ants also hanged around the brushes. But we use the Oral-B’s. .-= Moja Izba´s last blog ..Cornflour Maize amount converter =-. argh! argh! i had a recent attack by ants but luckily they never made it into the bathroom. it’s odd because you know ants don’t eat much, and they’re not holding any poison but a plague of them swarming over your precious belongings — like your TOOTHBRUSHES — always makes me scream like a girl. ha ha, maybe ants are like those cleaner fish that eat the bugs and algae off bigger fish. You just train up some ants to do the cleaning. It would save a fortune in tooth brushes and tooth paste and you could just keep a little ant farm in the bath room. Again?! But much more interesting this time with the pack being SEALED…do u get many ants elsewhere in the home? .-= mademoiselle délicieuse´s last blog ..New Shanghai Chatswood (??? ), 31 Dec 2009 =-. .-= Iron Chef Shellie´s last blog ..Breakfast BLT =-. Thank you for taking the time to contact our company. you soon with the information you need. This lot are Zig Zag brushes from the 6 pack sold through Woolworths. hehe well good that they replied. It can’t be the first email they’ve received surely? .-= Lorraine @ Not Quite Nigella´s last blog ..Quesadilla Cake – Ugly but Delicious =-. Are they cutting bits out to take away? i.e. are they seeing it as a food source or maybe giving some kind of congregation signal? What are they doing on the actual brush, hanging out, running around, acting weird? Also have you noticed any kind smell yourself? Okay, they just seemed to be crowding around, running around a little nuttily on the rubbery bits, staying on the colour…. I can’t smell anything strange about the toothbrushes. There’s no bits out of the rubber. to cause ants to be attracted to it. in providing us with this product. Please advise whether you use a soft or medium brush. bought by our consumers meets their needs and expectations. They SAY there is nothing used in the manufacture that would attract ants, but it would really seem its not so. You don’t dip toothbrushes in honey after you buy them or something ridiculous like that? I’m so curious as to why this would happen! .-= Tab´s last blog ..My Place & Yours – Most useful/used gadget =-. I’m finding this entire story extremely interesting. You’ll update again soon? .-= Lyvvie´s last blog ..I’m not Anti-Marshmallow =-. The very same thing just happened to me. 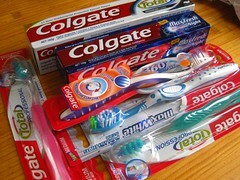 I bought a four-pack of Colgate 360 brushes from CVS ( in Miami). I opened the package, used one before bed, washed it off well and poured peroxide over it (something my grandma taught me to do – go figure), clasped my toothbrush cap over the bristles, and fell fast asleep. In the morning, while yawning and jumping out of the shower, I grabbed my toothbrush and gasped in horror! A gravillion trillion ants were creepily swarming my toothbrush. I threw it in the sink with disgust, blasted it with hot water, and threw it away. I searched for a new one from the package and was again horrified! 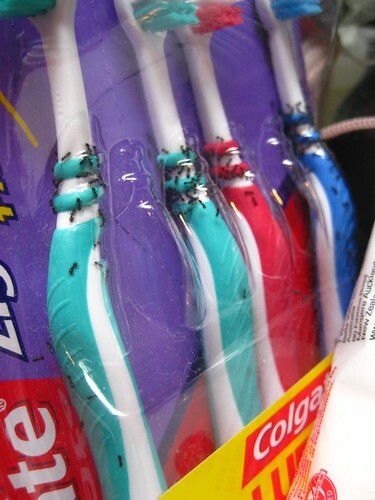 A vazillion bazillion more ants were crawling all over the colored rubber parts of each of the new toothbrushes in the package. The hard plastic parts were mostly clear of any anys. No residue appeared to be on the package, and I don’t remember drowning them in fondue pots of melted syrup prior to bedtime, so I’m not quite sure what that was all about. After ripping up and bleaching the entire linen closet where I also keep supplies of extra toiletries (and previously kept packages of toothbrushes), I took to google to find an answer to this mystery. I found your page! I’m thinking something must be going on with the rubber bits of the toothbrushes.